Everyone wants to create a filter, but in all honesty, there are a limited number of circumstances they make sense. 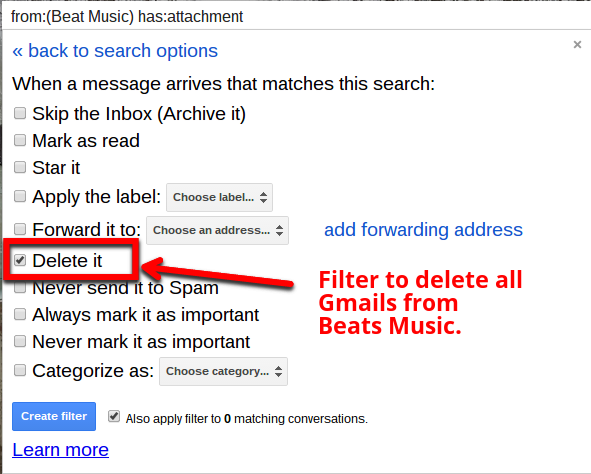 Google's multiple inboxes does an acceptable job of getting unwanted noise out the primary inbox. When I think of circumstances I could use a filter, it always seems simpler performing a search. In a few seconds I can perform a search which is as quick as finding a specific filter. One reason to use a filter that continues to stand out is getting rid of list serve or promotional emails which are difficult to unsubscribe. The example I will use is Beats Music. While I no longer use the service I still seem to be getting emails. The filter I created comes from a search of Beats Music in the To field. I would like to delete these emails and all future email that follow this criteria. After selecting Delete It, I choose Create Filter, and I am done.